Exodus 3:14 is universally recognised as being amongst the greatest interpretive challenges in the Bible. There has been no consensus on the meaning of this verse for at least 2,300 years because the meaning of just four words therein has defied all efforts at being convincingly explained. What makes these four words so intriguing is that one of them is identifiable in its context as a Divine name, and that this one accounts for three of the four under consideration. The four words of which I speak are ehyeh asher ehyeh in the first part of Exodus 3:14 and ehyeh in the second part. 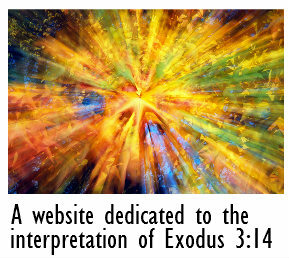 The main article in this site begins with an introduction to Exodus 3:14 in which I explain why this verse has so compelled the attention of religious thinkers and scholars alike. In Part I of the article I review the translations and interpretations of Exodus 3:14 in Judaism over the course of the last 2,300 years. In Part II I present my own analysis of the relevant biblical text and in so doing identify a seldom-recognised and poorly understood Divine name; the Hebrew word ehyeh. I present a comprehensive explanation of the meaning of this name and in so doing establish how it should be translated into English. Following this I explain the meaning of the Hebrew phrase ehyeh asher ehyeh, which also features in this verse, and finally present the translation of Exodus 3:14 that my interpretation implies. Elsewhere in the site I explore the most important implications of the meaning of the name revealed in Exodus 3:14 and give an account of how Exodus 3:14 and the name of God have been translated and interpreted in Christianity. The Files for Download page has the entire content of the website available for download. This content is added to and improved on an ongoing basis, with the most recent changes signaled in the Files for Download page. Although what follows has been written to a high standard of scholarship, it has not been written with only scholars in mind. Its subject-matter is relevant to all who are engaged in serious theological exploration and I believe that what follows will be of interest to all dedicated religious thinkers irrespective of their religious affiliation or educational background.